Soak tamarind and jaggery in water. Mix besan and water to make a paste. Boil chickpeas with salt and keep aside. Grind ginger and green chilies into a paste. Heat oil. Fry separately cubed potatoes, cauliflower and ladies fingers. Keep aside. Heat oil, add methi seeds, whole red chilies and curry leaves till it splutters. Add ginger-chili paste, turmeric, besan paste and 3 glasses of water. Just before it boils, add diced white radish, carrots and chickpeas. After 10 minutes, add other fried vegetables. Boil further. Add tamarind and jaggery pulp and salt as per taste. 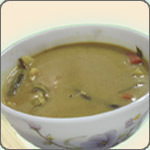 Serve with boiled rice and Sindhi papad.